An explosion billed as the "mother of all bombs" on the Transformers set Wednesday afternoon wasn't exactly as advertised. A few dozen fans flocked to Pilsen Wednesday in anticipation of a giant explosion near the silos on South Damen Avenue and W. 29th Street. There was an explosion, but it was hardly the "mother of all bombs" that some had predicted. "I'm kind of disappointed it wasn't what they claimed it was gonna be, but it was worth seeing anyway," said Jerry Clark, who showed up hoping to catch the pyrotechnics firsthand. Movie fans who flocked to Pilsen to the see the "mother of all bombs" leave disappointed. LeeAnn Trotter reports. But he was hardly the only disappointed fan. "I thought the whole building was going to come down ... but all you saw was a little spark and that's it," Danny Ramirac said. Rich Moskal of the Chicago Film Office said the early reports of it being the "mother of all bombs" was incorrect and overstated. 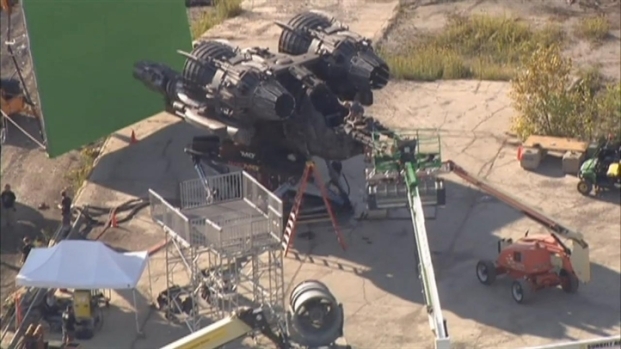 "Transformers" will wrap Chicago shooting for the latest movie will a big bang. 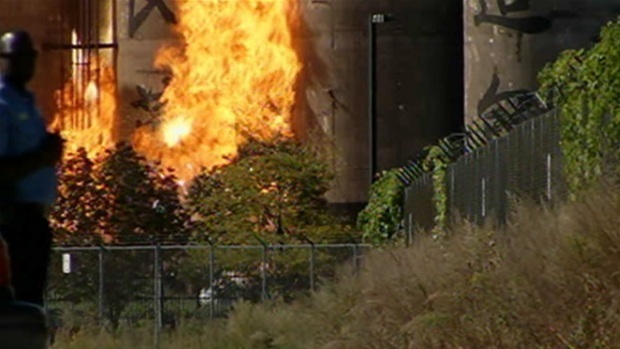 The explosion is set to take place near the silos on South Damen Avenue and W. 29th Street. Our chopper scoped the landscape before the boom. "Transformers: Age of Extinction" is the fourth installment of the film series and the second to shoot in Chicago. The movie stars Mark Wahlberg, Nicola Peltz, Kelsey Grammer and Stanley Tucci, it's directed by Michael and produced by Steven Spielberg. The crew is scheduled to leave Saturday barring any last-minute glitches that would require additional shoots. Scenes for the movie are also being shot in Detroit, Austin, Texas, and Hong Kong.